Has your skin been feeling dull and tired? Are you dealing with dry, flaky skin? Exfoliation is a key factor in keeping your skin looking youthful and radiant! 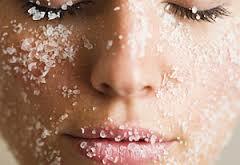 Exfoliation is the removal of dry and dead skin cells on the skin’s surface. Removing the dead skin helps prevent pores from being clogged. Other benefits include, stimulating circulation which promotes collagen production, fading of hyperpigmentation over time, reduction of ingrown hairs and aids in product penetration. Exfoliators can come in the form of a scrub, liquid or mask! There are two types of exfoliations, physical & chemical. With all the different types of methods out there today, how doyou know which one is best for you? Read below to find out more information! Physical exfoliation is manually scrubbing the skin using a store bought or homemade scrub, washcloth or body brush. This is usually the lightest form of exfoliation and is recommended 2-3x a week at home. It is important to choose a scrub that has a fine grit texture or that is in a powder form that can be mixed with water or cleanser. Scrubs with large beads or harsh particles (i.e apricot scrubs) have been known to scratch the surface of the skin and over time breaking down the strength of our skin’s natural barrier. It is also recommended to use your fingertips, a microfiber sponge or konjac sponge over a washcloth or Clarisonic. With proper care, these sponges can last up to 3 months and are gentle enough to use everyday, without irritation. Another popular form of physical exfoliation is Microdermabrasion. This add on treatment is perfect for dry, dull and tried skin. There are different variations of this treatment, including an instrument where sand-like crystals are dispersed to gently remove the top layer of skin or with a diamond tip attachment which resurfaces the skin with a vacuum like suction. This exfoliation is good for most skin types and requires little downtime. They can be performed by your local Aesthetician or Dermatologist office. Taking less than 15 minutes, this service aids in skin discoloration, age spots, hyperpigmentation, light scarring and removal of blackheads. It also improves product penetration and stimulates collagen reproduction! Dermaplane is another manual exfoliation which has been around for many years but has just recently started gaining more attention. The service provider uses a scalpel at a 45 degree angle while holding the skin taut to gently remove unwanted peach fuzz and dead skin cells. It is a popular exfoliation treatment on its own or before a chemical peel or laser treatment as it better allows deeper product penetration. It has been known to reduce fine lines and wrinkles as well as reduce recent acne scars. It requires no downtime and can prep the skin for better makeup applications. An enzyme mask or liquid is another great way to exfoliate. Enzymes derived from natural sources such as fruit, combined with enzymes on the skin, accelerate a chemical reaction allowing the enzyme to break down the dead keratin proteins. Under steam will accelerate the break down process and allow better penetration of ingredients. This treatment is recommended for more sensitive skin types and people prone to acne due to its effective but more gentle approach. Enzymes can be found in fruits such as Pumpkin, Papaya, Pineapple and Kiwi. Once removed, it will leave you feeling refreshed and radiant! Retinoids are a prescription strength medication that have been known to help reduce multiple skin issues, including acne. They can be taken orally or used topically. When used in a cream form, retinoids unclog pores causing other medicated creams to work more efficiently. It’s also been proven to stimulate new blood vessels and increase collage production! Retinol can sensitize the skin to sunlight and common skincare ingredients so it is important to let your skincare provider know if you are using them at home and/or if they are an ingredient in your current skincare products. Chemical peels tend to sound much more intimidating than what some actually are. Chemical exfoliants contain two types of Hydroxy acids; AHA’s (Alpha hydroxy acids) like lactic and glycolic acids and BHA’s (Beta Hydroxy acids) such as salicylic acid. Alpha hydroxy acids naturally occur in fruits, milk and sugar cane. They help even skin texture, smooth fine lines and wrinkles and stimulate cell renewal. Popular AHA’s include glycolic and lactic acid. Glycolic has the smallest molecular size allowing for deeper penetration and heightened results. Lactic acid is derived from dairy and is recommended for more sensitive skin types. The most common form of BHA is salicylic acid. Salicylic acid is best for oily or acneic skin types, or those concerned with blackheads, milia and large pores. It cleans deep in the pores keeping them from harbouring bacterias that cause breakouts. Chemical peels can take anywhere from 3-10 days of downtime and when paired with professional post care, ultimate results can be seen in 1-3 weeks! These treatments can be done as often as every 2 weeks depending on desired results. The most important thing to remember with exfoliating is not to over do it. 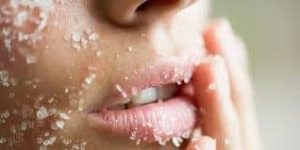 Over exfoliation can break down the natural skin barrier over time, cause broken capillaries and redness and irritation. Also, when exfoliating you are esentially drying the skin out further to promote flaking so you will want to use a hydrating B5 or hylauronic acid serum to keep the skin at an even pH level. It is best to discuss your options with an esthetician or dermatologist. There are many products currently available to the public that can cause futher damage if not used properly. If you are using a topical retinoid, some forms of exfoliation will not work for you until you have been off of it for minimum 3 days, depending on the strength. If you are currently taking a prescription for acne, consult with your dermatologist before using any harsh exfoliants as it can be irritating and cause imflammation.